Stripe tops overall satisfaction ratings while Braintree earns highest overall market presence score. 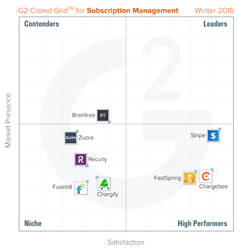 G2 Crowd, the world’s leading business software review platform, today released the Winter 2016 Subscription Management Software Grid report to help businesses make the best subscription management technology decision. Stripe, Chargebee, and FastSpring were named High Performers in the report, earning strong customer satisfaction marks with smaller market presence scores. Stripe earned the highest overall Satisfaction score while Braintree earned the highest overall Market Presence score. Service Matters - For all products, customer service played an important role in reviewers’ opinions. Reviewers in this category appreciated fast response times, multiple contact methods, and detailed implementation and setup materials from their software providers. First Impressions - Reviewers complained about a lack of customizability in places where their customers interact with the subscription management software. Payment pages were a common gripe among reviewers who were unhappy when they couldn’t customize the pages to match the design of their websites. Room to Improve - Email functionalities offered in subscription management software were rated slightly lower than other features. Reviewers called for more personalization and additional templates when using these tools to communicate with their customers. The average satisfaction ratings for email marketing, in particular, came in low at 68 percent. This suggests that these features have yet to be perfected by the vendors in this category. The report is based on more than 170 reviews written by business professionals. Of the roughly eight products listed in G2 Crowd’s Document Creation category, the ranked products each received ten or more reviews to qualify for inclusion on the Grid. G2 Crowd, the world’s leading business software review platform, leverages its more than 50,000 user reviews to drive better purchasing decisions. Technology buyers, investors, and analysts use the site to compare and select the best software based on peer reviews and synthesized social data. Co-founded by the founder and former executives from SaaS leader BigMachines and backed by roughly $12 million in capital, G2 Crowd aims to bring authenticity and transparency to the business technology market. For more information, go to G2Crowd.com.